© Katalin Deér, 2014/17. Courtesy Geoffrey Farmer. Today, many of us feel speechless at a time when the necessity for speech is urgent. The new Trump era has unhinged some deep hidden resentments, “in which people are so shameless in their meanness and their selfishness and their avidity and the willingness to judge almost everything by criteria of material gain…” Susan Sontag told Border Crossings in conversation 30 years ago. How do we move beyond our aloneness and isolation? The act of art making helps us connect with our selves, with others and with the world outside. Meeka Walsh discusses ethics and engagement in these difficult times in this issue’s Bordernotes. In the spirit of inclusiveness, in this issue we look outwards—at artists exhibiting internationally—and close to home, at national and local talents. 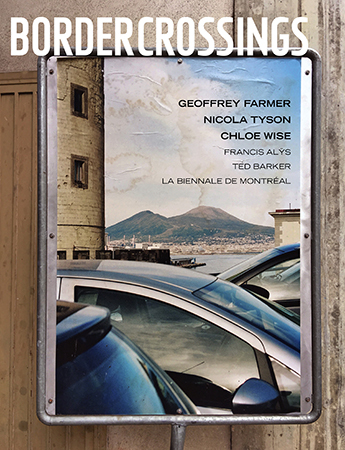 We have interviewed Geoffrey Farmer who is representing Canada at the upcoming Venice Biennale. Farmer is known for his large-scale, meticulously crafted installations. In his interview, he speaks about collaging, about the act of cutting and reconstructing and how the void which is sometimes created becomes ripe with new potential. Nicola Tyson is a New York based British artist. Tyson paints figural hybrids, fantastical creatures that assume the gestures of animals, birds, and other flying things. She talks about drawing as “mapping around with a pencil” and she describes her overall approach to composition as “mapping this very delicate dance where consciousness enters matter.” Tyson’s work is as alluring as her many mythical figures are fantastic. Stephen Horne discusses how the Montréal Biennale is making Montréal an international hub of art and culture and questions how to curate a conceptual ‘whole’ amidst a diverse selection of international artists. Georgia Phillips-Amos discusses the work of artist Francis Alÿs whose famous paradox: “Sometimes making something leads to nothing,” stands as a metaphor for trying to get by in Mexico City in the face of overwhelming corruption and violence. And… we present a beguiling portfolio of new drawings by Winnipeg artist, Ted Barker. The review section includes: painter Simon Hughes, Meryl McMaster, artist-curator Ydessa Hendeles, Ted Barker, Nika Fontaine, photographer Elaine Stocki, Bharti Kher, Diyva Mehra, Kevin Kelly and a look at the exhibits: Matisse/ Diebenkorn, Postwar: Art Between the Pacific and the Atlantic, 1945-1965, Superimposition: Sculpture and Image and the 32nd São Paulo Biennale, Incerteza Viva. Canadian student subscriptions available now for only 24 CAD per year!